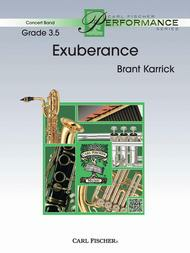 Exuberance (full set) composed by Brant Karrick. For concert band (flute 1 (piccolo), flute 2, oboe 1, oboe 2, clarinet 1 in Bb, clarinet 2 in Bb, clarinet 3 in Bb, bass clarinet in Bb, bassoon 1, bassoon 2, alto saxophone 1 in Eb, alto saxophone 2 in Eb, tenor saxophone in Bb, baritone saxophone in Eb, trumpet 1 in Bb, ). Concert Performance Series. Score and parts. Duration 7 minutes, 20 seconds. Published by Carl Fischer (CF.CPS128).ISBN 9780825888274.As the title implies, this piece is exciting from the get-go! Built around a hymn-like theme, the piece moves through many guises of theme in the exceptional new piece by established composer Brant Karrick. It is sophisticated and fresh -- a total crowd-pleaser.